Workshop themes were “Different Aspects of Prediction, Use of Water Covers as a Mitigation Strategy and New Developments.” The 25 technical presentations included overviews of methods and key properties and processes, and case studies from mine sites in Argentina, Australia and Sweden as well as Canada and the United States. Photo: Kemess flooded impoundment after deposition of tailings from oxidized ore, W. Price. Sumi L. Community Participation in Environmental Monitoring at Mine Sites. 8th British Columbia MEND Metal Leaching/Acid Rock Drainage Workshop. Vancouver. 2001. Meech J., R. Pakalnis and B. Lang. CERM3's Millennium Plug Project at the Britannia Mine. 8th British Columbia MEND Metal Leaching/Acid Rock Drainage Workshop. Vancouver. 2001. Tremblay G. Canadian Environmental Initiatives in 2001. 8th British Columbia MEND Metal Leaching/Acid Rock Drainage Workshop. Vancouver. 2001. Hogan C. Toxicological Investigations of Mining Effluents (TIME) Network. 8th British Columbia MEND Metal Leaching/Acid Rock Drainage Workshop. Vancouver. 2001. Lussier C., M. Veiga and S. Baldwin. Geochemistry of Selenium Mobilization from the Elk River Coal Mines. 8th British Columbia MEND Metal Leaching/Acid Rock Drainage Workshop. Vancouver. 2001. Sollner D., D. Hockley, J. Chapman and K. Black. Predicting Water Quality from the Reflooded Mine at the Crandon Project. 8th British Columbia MEND Metal Leaching/Acid Rock Drainage Workshop. Vancouver. 2001. Vos R.J. and T. O'Hearn. Sulphate Mineral Speciation by Sequential Extraction for the Proposed Veladero Mine, Argentina. 8th British Columbia MEND Metal Leaching/Acid Rock Drainage Workshop. Vancouver. 2001. Logsdon M., D. Blowes, M. Baker, J. Jambor, I. Ritchie and U. Mayer. Characterizing Geochemical Impacts of a Low-Sulphur Waste-Rock System: Diavik Project, Lac de Gras, NT, Canada. 8th British Columbia MEND Metal Leaching/Acid Rock Drainage Workshop. Vancouver. 2001. Raudsepp M. and E. Pani. Quantitative Phase Analysis of Tailings and Waste Rock using the Rietveld Method and X-ray Powder Diffraction Data. 8th British Columbia MEND Metal Leaching/Acid Rock Drainage Workshop. Vancouver. 2001. Shaw S. and A.M. Robertson. Geochemical Predictions of the Landusky Spent Ore Heap Leach Pads and Implications for Water Management. 8th British Columbia MEND Metal Leaching/Acid Rock Drainage Workshop. Vancouver. 2001. Jambor J., J. Dutrizac, L. Groat and M. Raudsepp. A Mineralogical Perspective of Tests for Neutralization Potential. 8th British Columbia MEND Metal Leaching/Acid Rock Drainage Workshop. Vancouver. 2001. Price W. Use of Fresh Water Covers as a Mitigation Strategy at Mines in British Columbia. 8th British Columbia MEND Metal Leaching/Acid Rock Drainage Workshop. Vancouver. 2001. Bliss M., B. Hamblin, D. Ross and C. Ford. The Samatosum tailings Water Cover: Six Years of Success. 8th British Columbia MEND Metal Leaching/Acid Rock Drainage Workshop. Vancouver. 2001. Ohlander B. Results from the Flooded Stekenjokk Tailings. 8th British Columbia MEND Metal Leaching/Acid Rock Drainage Workshop. Vancouver. 2001. Kwong J. Metal Mobility under a Water Cover - Observations from Laboratory Studies. 8th British Columbia MEND Metal Leaching/Acid Rock Drainage Workshop. Vancouver. 2001. McNee J., A. Martin, J. Crusius and E. Yanful. Post-Closure Metal Mobility in Subaqueous Tailings Deposits. 8th British Columbia MEND Metal Leaching/Acid Rock Drainage Workshop. Vancouver. 2001. Martin A., J. McNee and T. Pedersen. Post-Closure Mobility of Arsenic in Mine-Impacted Lake Sediments. 8th British Columbia MEND Metal Leaching/Acid Rock Drainage Workshop. Vancouver. 2001. Vigneault B., P. Campbell and A. Tessier. Geochemical Study of Sulfidic Mine Tailings Stored under a Shallow Water Cover. 8th British Columbia MEND Metal Leaching/Acid Rock Drainage Workshop. Vancouver. 2001. Lawrence G. Fluid Mechanics and the Effectiveness of Water Covers. 8th British Columbia MEND Metal Leaching/Acid Rock Drainage Workshop. Vancouver. 2001. Yanful E. Resuspension of Flooded Mine Tailings. 8th British Columbia MEND Metal Leaching/Acid Rock Drainage Workshop. Vancouver. 2001. Hinton J., A. Hodaly, M. Veiga and S. Baldwin. Water Covers to Wetlands: Opportunities and Constraints. 8th British Columbia MEND Metal Leaching/Acid Rock Drainage Workshop. Vancouver. 2001. Crusius J., R. Pieters, A. Leung, P. Whittle, T. Pedersen, G. Lawrence, J. McNee, and A. Sahami. Comparative Geochemistry of Two Pit Lakes. 8th British Columbia MEND Metal Leaching/Acid Rock Drainage Workshop. Vancouver. 2001. Stoltz E., M. Greger and L.O. Hoglund. MiMi: Establishment of Vegetation on Water-Covered Mine Wastes - Integration in the Performance Assessment Framework. 8th British Columbia MEND Metal Leaching/Acid Rock Drainage Workshop. Vancouver. 2001. Mann G. and R. Baker. 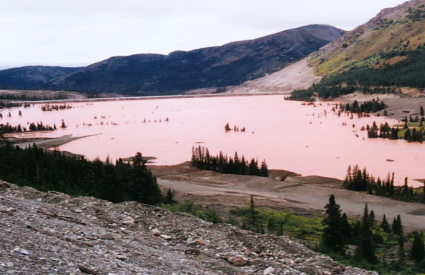 Application of Ecological Risk Assessment to Water-Covered Mine Wastes. 8th British Columbia MEND Metal Leaching/Acid Rock Drainage Workshop. Vancouver. 2001. Warren L. Biofilm Control for Metal Mobility in ARD. 8th British Columbia MEND Metal Leaching/Acid Rock Drainage Workshop. Vancouver. 2001. Harpley D. and S. Newman. Benambra Tailings Mangement Facility (TFM) Closure and Rehabilitation. 8th British Columbia MEND Metal Leaching/Acid Rock Drainage Workshop. Vancouver. 2001.